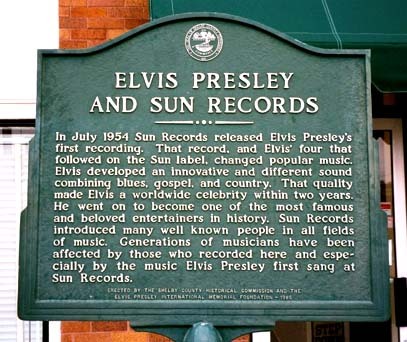 The historical marker that mentions Elvis leaves out plenty of other musicians who were introduced to the world through Sun Records. 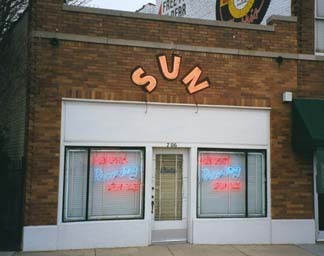 Johnny Cash ("I Walk the Line"), Carl Perkins ("Blue Suede Shoes"), Jerry Lee Lewis ("Great Balls o' Fire"), Roy Orbison ("Only the Lonely") and plenty of others got their start here. Also a little-known Californian named Ken Spreitzer. This is the whole studio. (Next door on the right is a restaurant and gift shop.) There's a tiny office in front. The recording room is in the rear. And in between is the room where musical history was made, again and again. 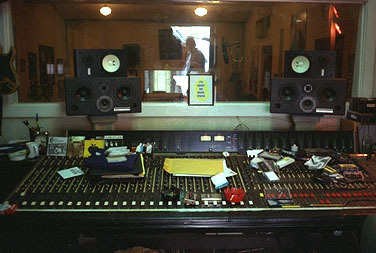 The studio "tour" takes place in that one room. They tell you about who played there, and they play outtakes from recording sessions, and they tell you who stood where and said what. It's a famous room. 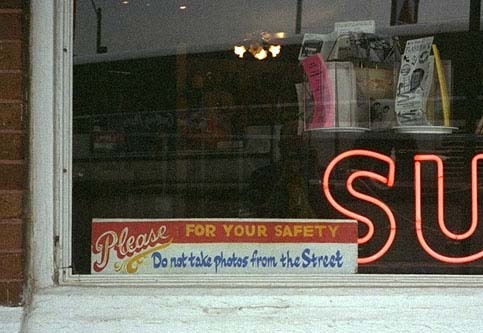 In between those days and these days, the building was used for a variety of things, including a shop that sold scuba gear, but it's always been a low-rent area, so nobody ever redid the interior. 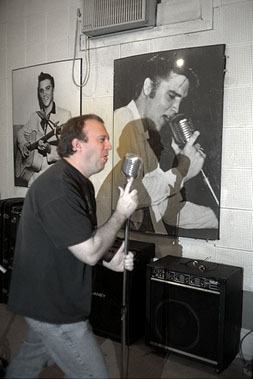 When they reopened the studio some years ago, all the original soundproofing tiles were still in place. The second time we went by Sun, the back door was open and we got a peek at the control room, which (unlike the rest of the studio) has been outfitted with modern equipment. In recent years, all kinds of people have been making the pilgrimage to play here, now that it's open again. 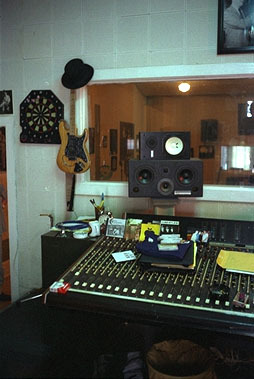 Brian Setzer came through here, and U2 used the studio to record a few cuts for their tour album Rattle and Hum. Apparently it's in use for recording just about all the time there's not a tour in there. The place was easy to find--we were delighted to run across it serendipitously, on Union Ave., on our way to Graceland. We immediately knew we were going to come back here. 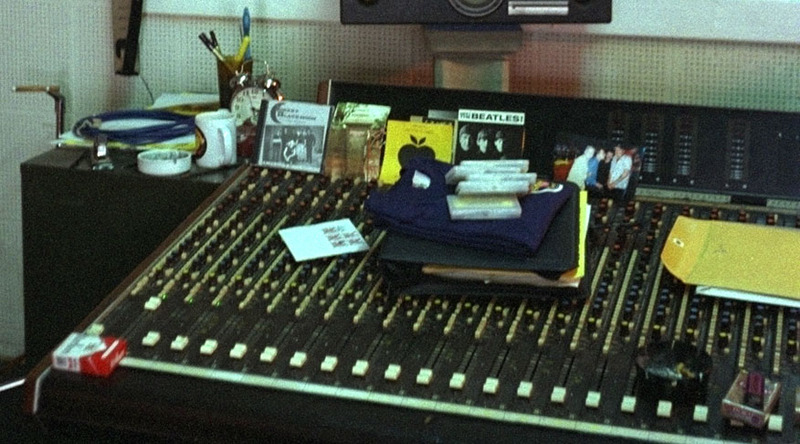 Click on the picture above for a detail of the stuff on the mixing board. 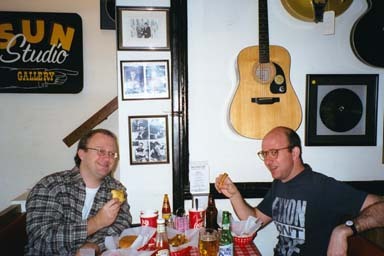 Ken and Doug having a bite before we hit the road. That's Doug on the right, having an Elvis Special: Fried peanut butter and banana.